Different Types of Flowers – The biggest producer of preserved plants and flowers, has different types of flowers that are perfect for gift-giving, events, and even ornamental interior décor. Normally, a bouquet will consist of the featured or main blooms and an assortment of filler flowers to accent the main blooms. We try to explain what certain flowers look like to their customers over the phone, but this can be a difficult process. Below, we have listed 100+ Different Types of Flowers and Their Names which florists often use to help you understand the common types of flowers which are sent when you buy flowers. Used by florists primarily as a filler flower, Alstroemeria can be found and naturally spreads in the wild. A perennial flower that usually holds an orange color, hybrids of Alstroemeria can be found in yellow, white, pink, and red colors. 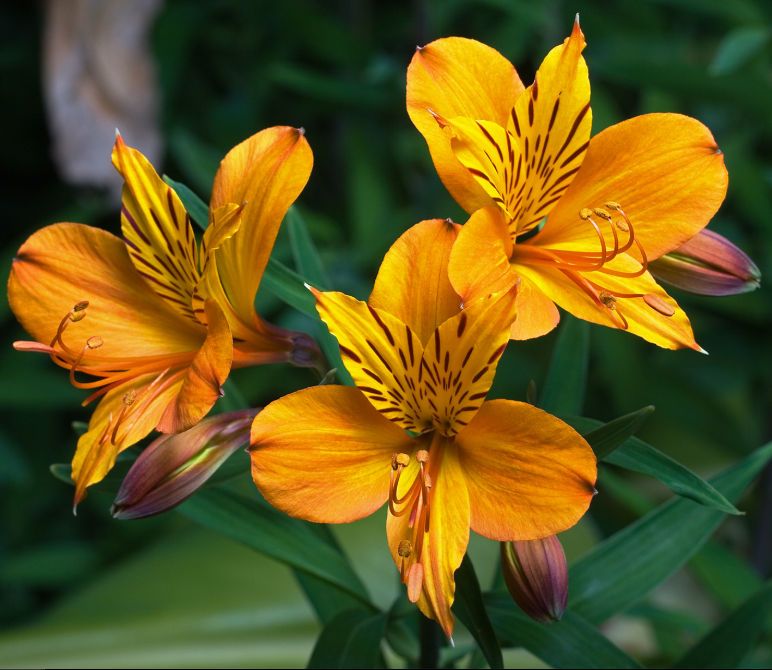 Alstroemeria, with its small stature yet beautiful detail is often called or known as a Peruvian Lily. It’s likely if you ask a florist for this flower by either name they will know what you are looking for. As a colorful filler flower, Alstroemeria can be used with an assortment of other blooms. Commonly used flowers in arrangements with Alstroemeria include Roses, Lilies, Gerbera Daisies, and Asters. Alone in an arrangement, Alstromeria may carry the meaning of friendship. Amaryllis, also known as the Belladonna Lily, is a bulbous plant that flowers from late December to late June. The blooms sprout from a leafless stem, up to 12 blooms per stem. 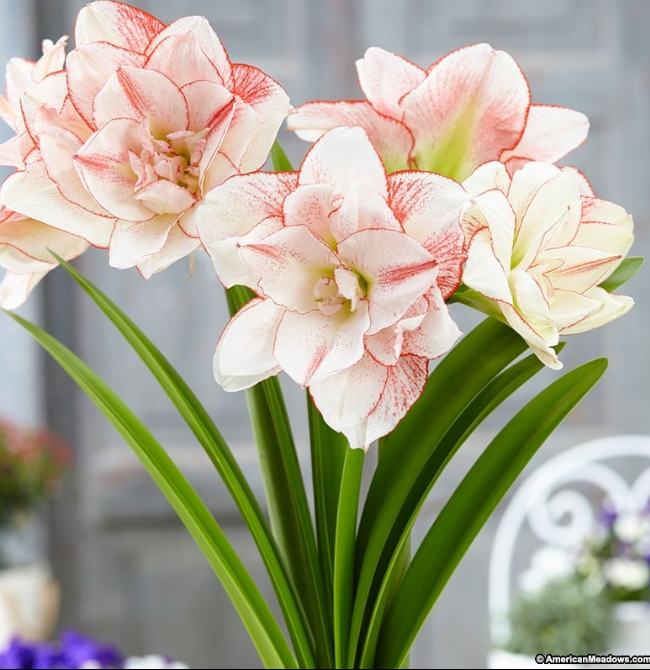 Amaryllis has many color varieties, including red, white, pink and orange, in addition to varieties that are white with colored veins. Each bloom itself is six to ten centimeters in diameter, while the plant grows up to 60 centimeters tall. The foliage consists of several long and thin leaves, two to three centimeters broad and 30 to 50 centimeters long. Amaryllis bulbs should be planted between October and April. The ideal planting temperature is 68 to 70 degrees F. The bulbs themselves don’t need much water, but after leaves and a bud appear, it’s important to increase the water. After seven to ten weeks, the bulbs will flower. Once a blossom begins to fade, it’s important to remove it, prolonging the flowering season and keeping the plant healthy. If the climate is warm enough for the Amaryllis to grow outside (60 to 75 degrees F at the least), these tall flowers should be planted in a sunny spot where they don’t overshadow smaller plants. Inside, plant in a sunny window with a sandy-loam soil mix. In a pinch, Amaryllis will grow in any good, well-drained soil. In a bouquet, it’s important to remember the height of the blooms. These flowers are very versatile because there are so many variations. Paired with daintier bundles of blooms will make for a stunning piece. 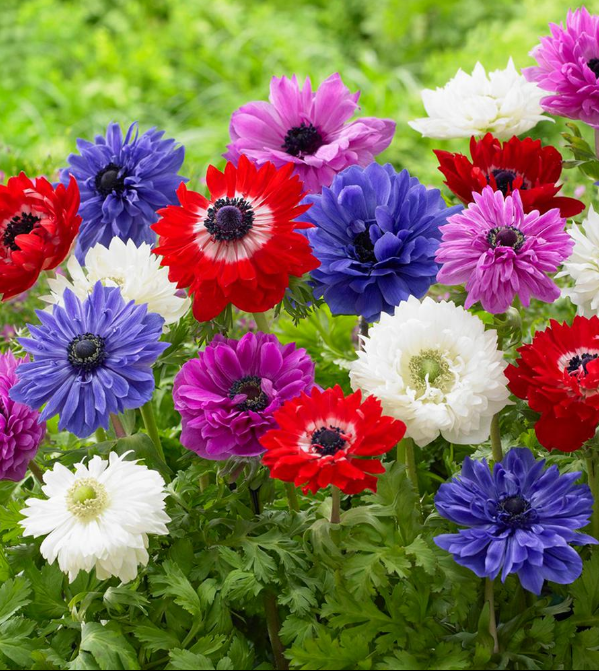 Anemone, perennial plants that grow from tubers or seeds, grow up to two feet tall and come in a variety of colors, including red, blue, purple and white. The bloom grows from a single stem that has a patch of parsley-like leaves. The flower itself consists of eight to ten rounded petals fanning out nearly parallel to each other. The stalks grow up to eight inches tall. Planted in October, Anemone flowers in May and June. They grow best in partial or full sun. In southern climates, the Anemone should be shielded from the sun in the warmest part of the day. Tuberous anemones should be planted two to three inches in the ground. Depending on the variation, Anemones can prefer either sandy or moist soil. Cut Anemones do not fare well in vases because the flower?s fresh juice can be very irritating to the skin. This is a shame because Anemones are striking flowers. However, Anemones make wonderful dry flowers to keep for years and years. If you are set on using Anemones in a floral arrangement, a potted Anemone works very well. As the blooms fade, trim them and fresh blooms will grow in their place. 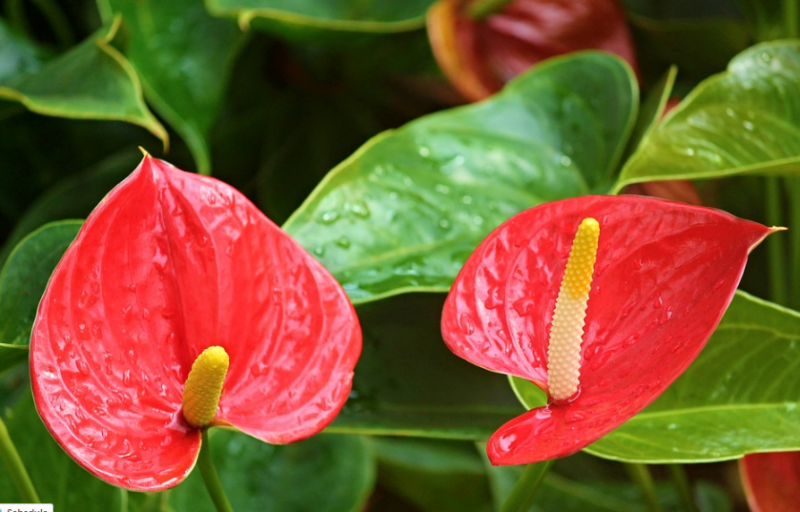 Anthurium, a genus of 600 to 800 species of flowers, is also known as the ?flamingo flower.? These hermaphrodite flowers bear fruit and can be grown in mild climates. Anthurium blooms are very small and crowd on a fleshy stem called a spadix. The spadix can grow in many different shapes and colors, most commonly red. The leaves are large and simple. Anthurium grows to about 30 centimeters tall. These flowers make excellent houseplants, as they do not require much sunlight and they prefer a milder climate. However, they do not tolerate frost or freezing conditions. Make sure that you keep you Anthurium well-watered, but be careful not to soak the bulb entirely. In a yard or garden, Anthurium does well against fences and trees, as many varieties tend to climb. Lovely in a flower arrangement, Anthurium has a vase life of up to six weeks, depending on the variety. The thick spathe is better in a wide and not tall bouquet. The Asiatic Lily has six long and narrow petals that spread around the stem with up to six pistils in the center. Asiatic lilies are bulbous plants that are very hardy and easy to grow. 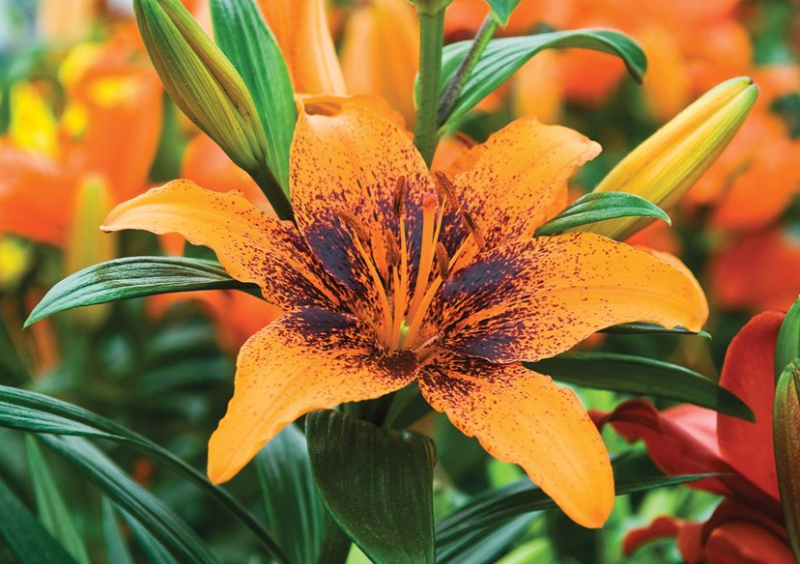 Although a popular color is orange, Asiatic lilies can be yellow, pink or cream. They bloom from June to early August in nearly any type of soil. Growing best in full sunlight, this variety of lily grows up to four feet tall. When planting Asiatic lilies in a yard or garden, it?s good to plant the bulbs eight inches apart in groups of three to five for the most striking effect. As your plants grow, be careful to protect them from pesky animals like rabbits. Keep the plant moist but do not plant the bulb in soil that does not drain well. Asiatic lilies are wonderful cut flowers. Because the blooms are three to six inches wide, they add bursts of color to any bouquet. They do not have a strong scent, so they are great to pair with more fragrant flowers. Aster is a genus of 600 species of plants native to North America. Aster flowers are an inch and half wide and bloom from August to October. The plant itself grows two to four feet tall. 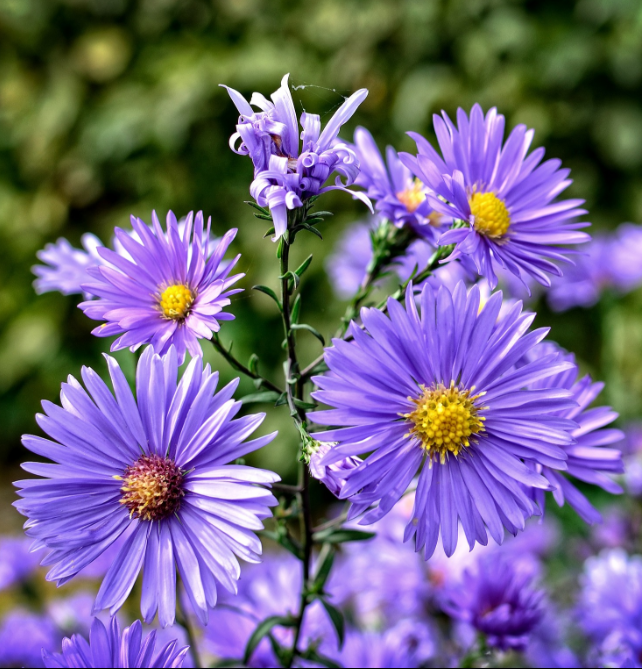 Aster blooms are similar to daisies, but have bright colors like purple, lavender, pink or red. These are popular garden plants but, because of their size, work well in pots. Asters can be annuals or perennials, depending on the variety. These are easy to grow, but require full sunlight. Asters should be planted at least 18 inches apart from one another because, as they grow, they form little bushy clumps. If you are working with annual asters, do not plant them in the same spot of the garden every year, but rotate them. Smaller varieties of aster, which can be planted as close as six inches apart, can make a lovely border for a garden area. Larger varieties should go further back into the garden, to create a backdrop. When arranging Asters into a vase or bouquet, the sturdy stalks should be cut low. A small, round container with a bundle of Aster is splendid, but Asters can also showcase a larger flower that would rise from behind the bouquet. The lovely Birds of Paradise is native to South America, where it is commonly referred to as a crane flower. This genus is Strelitzia and there are five variations of this flower. The name Birds of Paradise comes from the appearance of the bloom, which resembles a brightly-colored exotic bird mid-flight. Each bloom has three orange and blue petals. Some variations have yellow hues as well. The foliage of the Birds of Paradise is made up of two ranks of leaves shaped like banana leaves. While this plant can grow up to 10 meters, most varieties only grow to three or four meters tall. The leaves themselves can be six inches wide and up to 18 inches long. The Birds of Paradise is spectacular in a vase by itself because of the intensley bright hues. But if you were to couple this flower into an arrangement, it would need to be bound together or somehow supported so that it didn’t bruise smaller flowers. 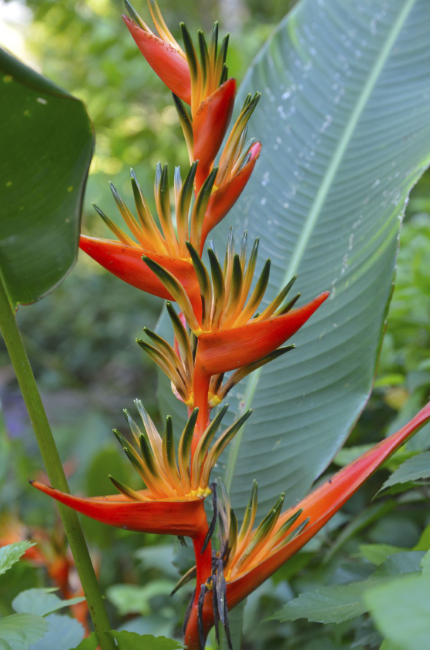 Birds of Paradise are often referred to as the symbol of exotic flowers. Growing the Birds of Paradise is best accomplished in an area that does not generally have a temperature drop below 50 degrees Farenheit, or in a greenhouse. When planning the flowers position in landscaping, the height of the flower should be taken into consideration so that smaller plants are not overshadowed. During spring and summer, the Birds of Paradise needs to be watered generously daily, but during the fall and winter should slow down. This is simulate the precipitation of its homeland, South America. Likewise, if you choose to use fertiziler, lay off a bit in the fall and winter. Plant in a sunny spot in the yard, as these plants are accustomed to a great deal of sun. 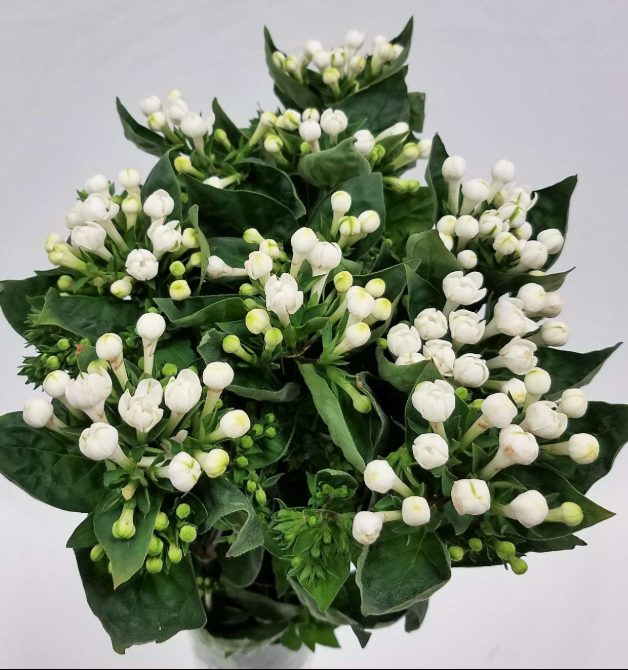 Bouvardia, a genus of about 30 evergreens and shrubs native to Central America, have single or double flowers shaped like stars growing out of a thin neck. The pointed green leaves grow three to eleven centimeters long and the flower stands to 15 centimeters tall. Bouvardia can be white, yellow, pink or red. Since Bouvardia is native to a tropical zone, they make better greenhouse plants in milder climates. If you choose to plant Bouvardia indoors, pot it in a five to six inch pot. The best time to pot Bouvardia is in March, because it blooms in fall and winter. Since these flowers grow in bushes as opposed to singular plants, they don?t work well in bouquets. But they are fabulous in a garden plot or bordering a section of the yard, if the climate is willing. As houseplants, Bouvardia needs a lot of sunlight, but not full sun. These plants grow best in a 65 to 75 degree F home or hothouse.